Mario Tauchi’s show of drawings, one on wall but the rest on paper, at HACO (an alternative gallery on the edge of the East River in Williamsburg) combines a graffitti esthetic with a strong component of mandala art. Tauchi, an artist in his mid-forties, living and working in Tokyo, combined with the space’s director Yoko Suetsugu to put up a group of works that are linear and organically complex. The drawings manage to successfully merge Western and Asian esthetics; Tauchi spent two years in Philadelphia as a student, and is clearly influenced by the street culture lying at the basis of American popular art. At the same time, the curving intricacies of his paintings, achieved by felt pen, relate an ongoing interest in the mandala, the Buddhist aid to meditation. Who would have thought that the merger of these two very different points of view would work? They do work, though, very much so, in this set of pieces that indicate once again the current esthetic for aligning cultures coming from very distant geographical points. Mario Mandala, “Untitled”, Mural drawing with marker, 8’x10′. 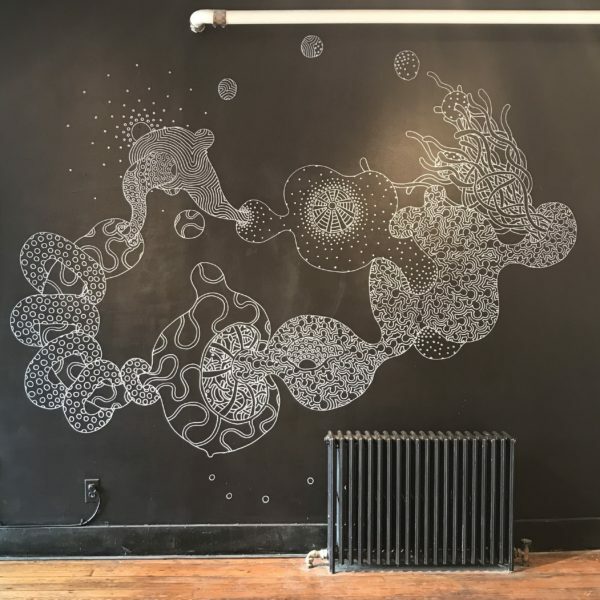 The large work done on a black wall, called Untitled (Mural) (2019), covers a span of eight by ten feet. It consists of an uneven ring of biomorphic, globular shapes, each one containing a different organic pattern. In one of the contained spaces on the upper left, a small spray of semicircular patterns, forming something like a vault, rises out of the shape it is connected with into empty space. 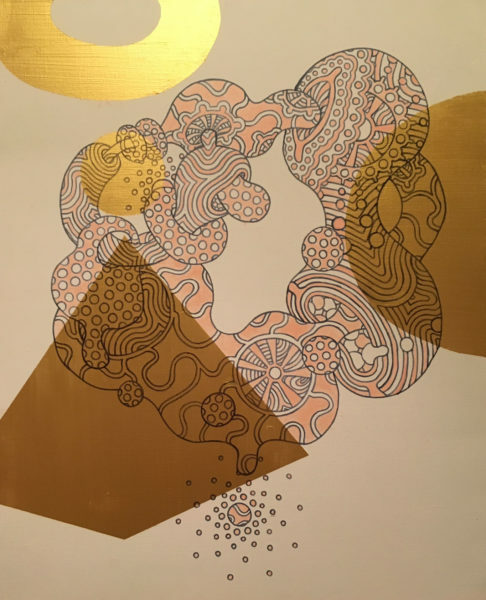 The overall plan of the work is improvised; the shape of the connected forms might be a series of galaxies tied together in space; or, less poetically, a group of designs whose pattern might be found on a rug or paisley wallpaper from the 1970s. 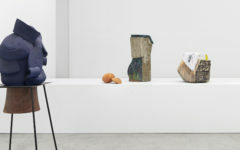 Generally speaking, the show merges these intricate, linear schemes in ways that emphasize joined imageries, abstract in expression and directed toward an elegance of means, visually and intellectually. The Mural expresses this very well, and its limited life on a wall that will be painted over accentuates our experience of its momentary design. 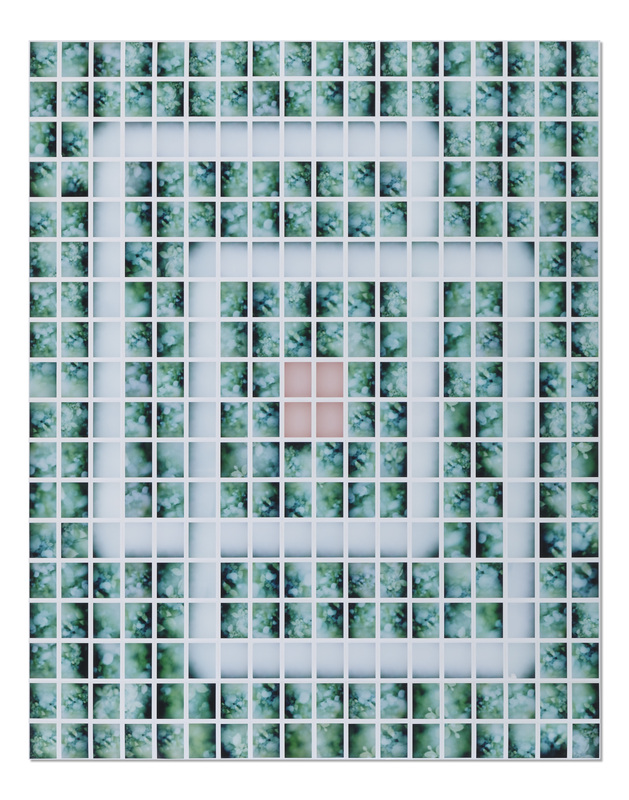 Mario Mandala, “PDG”, acrylic painting, marker drawing, 42″x 36″. Mario Mandala, “Authentic”, pencil drawing on Japanese rice paper, 31″x 45″. 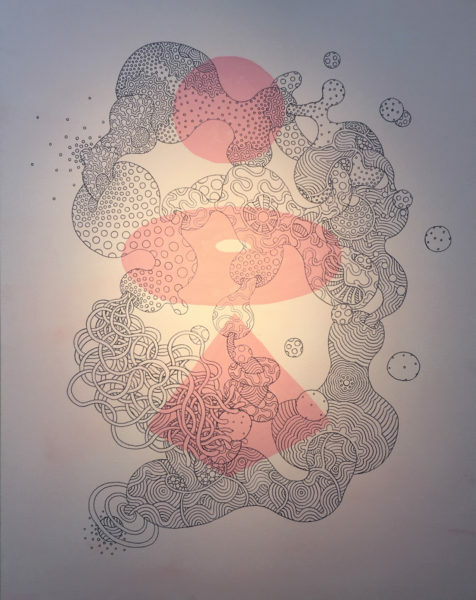 Another, smaller work, called Emptiness (2018), consists of a light-red sphere, donut, and pyramid vertically produced over a chain of organic forms, which like those that form the mural, interlock as they build a connection from one shape to the next. On the left side, one of the connecting elements looks very much like a mass of spaghetti; inside and outside this necklace of shapes are small, slightly rough spheres that create a momentary equilibrium with the larger forms they embellish. The three red geometric forms, more sculptural than two-dimensional, exist in contradistinction to the chain of black shapes they exist on top of. Perhaps the title gives us the sense of a Buddhist perception; it is as if the composition were deliberately filling a void with abstract visuals. Authentic (2018), a drawing on paper, uses color more than the other works on show. It consists of a golden circle with an open center on the upper left, a brown pyramid on the left, and a brown sphere on the upper right (none of the forms is visually complete). Underneath these images is a wreath of complex, interlocking shapes, much like those described above, but with a difference: they are colored light red and white. Forms penetrate other forms, establishing a sexualized, if abstract, imagery. 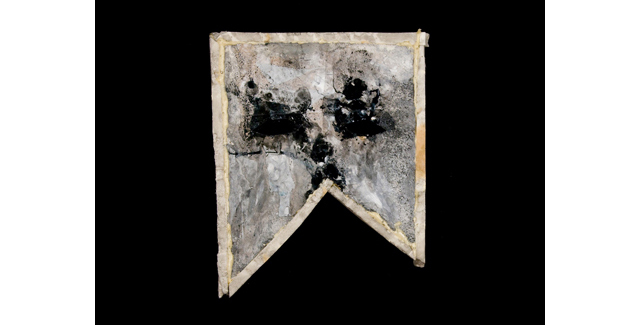 The work conveys something of a manmade ambience, something of a cosmic atmosphere. Mario Mandala, Emptiness, acrylic painting, marker drawing on canvas, 32″x 26″. Emptiness (2018) presents a large, false Japanese character on top of a double wreath of linked shapes brought about in black color. One immediately thinks of the Zen Buddhist notion of the void, even if the design we see fills the space it has been painted on. 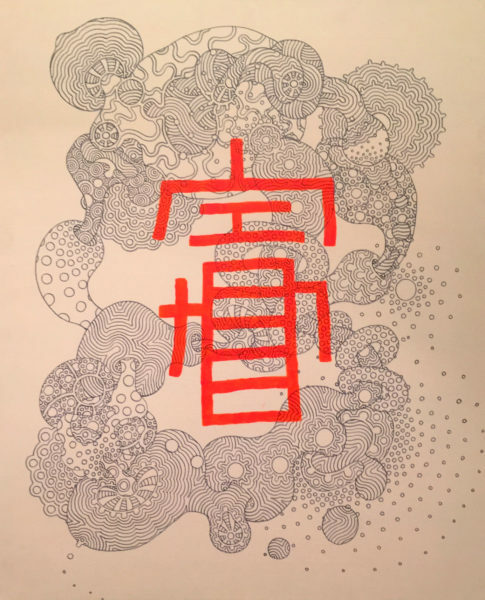 The imposition of an unreadable character on Tauchi’s characteristic welter of complicated forms, along with a distinctly spiritual title, indicative of Buddhist thought, creates a broad array of experience, visual and philosophical. The experience of the show, in general, is not overtly spiritual–the mandalas, always distorted here, seem to be used for visual reasons rather than religious ones. But, still, it is impossible to disassociate the mandala from its original purpose in meditation. It cannot be made completely secular. Perhaps this is the strength of the show: its mixture of the worldly and implications of Buddhist spiritualized forms in works that demonstrate unusual skill and compositional intelligence. Cross-cultural seeing and creativity have become near clichés by now, yet commonplaces of this sort are not completely without meaning. Tauchi discovered a street esthetic in America, and he uses it. Additionally, he remains a claimant of Asian perception. The combination is not easy to handle, given that the differences between Tokyo and New York are so great–in ideas and in art. But he has successfully set up a series of correspondences in paintings that speak to the jumbled, cross-pollinated spirit of our time. He is to be congratulated for his efforts. Jonathan Goodman is an art writer based in New York. 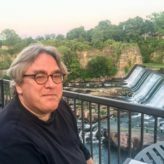 For more than thirty years he has written about contemporary art–for such publications as Art in America, the Brooklyn Rail, Whitehot Magazine, Sculpture, and fronterad (an Internet publication based in Madrid). He currently teaches contemporary art writing and thesis essay writing at Pratt Institute in Brooklyn. It opens my eyes on Mario’s art. It is an excellent review. 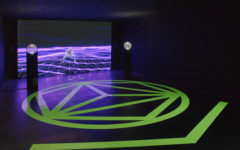 Arlene Shechet: Turn up the Bass at Sikkema Jenkins & Co.